There are things people routinely store: clothes, food, exercise equipment, furniture, antique photographs, etc. But water? Hmmm, an interesting concept. Believe it or not, the average person needs to drink at least one gallon of water per day. And that doesn't include water for important tasks such as bathing or cooking. So, when an emergency arises, it stands to reason that clean water is one of the most precious commodities around. · Size — Strive for a container that holds 14 gallons per family member. 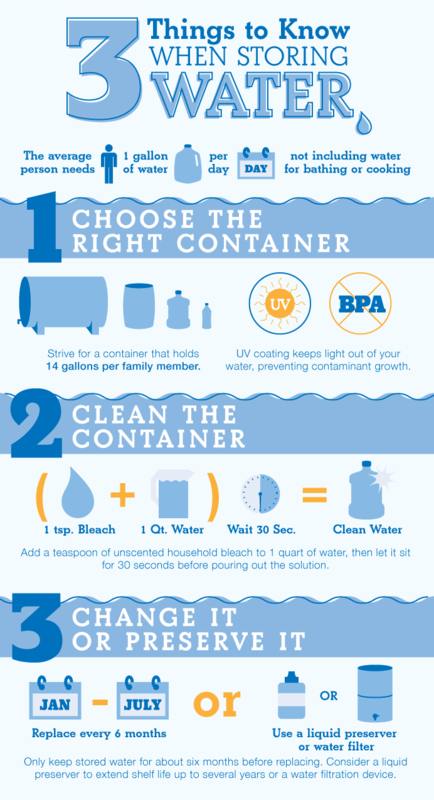 · UV yes, BPA no — UV coating keeps light out of your water, preventing contaminant growth. And you won’t want your unit to have BPA in the material, because this chemical can seep into the water. Once you have a water storage container, make sure it’s sufficiently clean before filling it up. Add a teaspoon of unscented household bleach to 1 quart of water, then let it sit for 30 seconds before pouring out the solution. 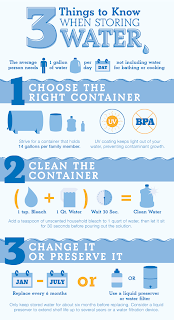 Your container is now clean and ready to store water. You should only keep your stored water for about six months before swapping it out for fresh stuff. But if that sounds like too much of a hassle, consider using a liquid preserver to boost your water’s shelf life up to several years. You can also purchase water filters or a water filtration device. If a natural disaster occurs, the absolute last thing you can afford to be without is clean water. Considering how good people are at storing things, why not put this skill to good use for your family and invest in water storage? This guest post is a courtesy of Food Insurance ™. The amount of man-made occurrences and natural disasters continues to climb. It's during these times that electricity, gas and water supplies aren't functioning. There are also emergency situations where you may be quarantined to your home, or even evacuated from it. Either way, you probably won't have access to groceries because most stores will be closed. So, what will you do? How will you feed your family? As you know, anything you buy in bulk will get you more for your dollar. Buying non-perishables and other foods in bulk allows you to pay the lowest prices possible, per item. If you do choose to go this route, be sure to check the expiration dates of your products. The last thing you want is to have a need for your emergency food storage just to find out everything has spoiled or turned rotten. In today's economy, it may put a dent in your finances to buy large quantities of food at one time. This is especially true with food storage, as these are foods you won't be eating until a future date. If you're on a strict budget, a good way to build up your food storage is to buy a little bit at a time. Each time you go grocery shopping; simply add a few items that will go directly into your emergency food supply. In time, it will build up to include the amount of products needed for you and your family's emergency crisis. Are you a coupon-clipper or sales-watcher? If so, this is another cost-efficient way to start your food supply. Let's say you see a 2-for-1 coupon or a sale on a food item you generally buy. Simply add one to your pantry, and the other to your food storage. Keep following this procedure on a regular basis and you'll soon have the food supply you need. Many people don't even think of this great idea. You'd be amazed at some of the items in your pantry and kitchen cabinets that would make great additions to your emergency food supply. Go through them today! If you have two containers of salt, add one to your storage. Do you see 12 boxes of mac n' cheese. At least six of those can be stored away for an emergency. Continue this process until you've gone through all of the duplicate food items in your kitchen. These foods are one of the best investments you can make towards your emergency preparedness plans. Freeze dried food is prepared before being flash frozen. That means that they retain their quality, freshness, look and great taste. The foods also last more than 25 years, giving your family decades of security. This content was prepared by Dirk Puckett. Daily Bread is an industry leader in long-term food storage plans. Ready to begin putting your food storage plan together? Start here and place your order today. Catastrophes always strike without warning. When they do, they hinder the services of local government agencies and community emergency crews. Their equipment, communications, buildings, and personnel will all be affected, making them basically immobile. If this happens, there will be no one to respond to your emergency calls in a timely fashion. This could be a very overwhelming situation for you, unless you're prepared. · The human body can only go only so many days without water before suffering from dehydration. During major emergencies, local water services may become contaminated, or simply may not be working at all. It's vital to your survival that you have enough clean drinking water to last until these local services are restored. · Experts recommend such a large amount of water per day because you'll also need clean water for more than just drinking. Your water supply will be there when you need to bathes, wash dishes or clothes, brush your teeth, and other hygienic purposes. · Being prepared with emergency food storage will really help to ease your stress during a crisis situation. Remember that your local stores will have suffered the crisis with you. So, they will probably be closed, along with all your other local businesses. Also, credit card processors and ATM machines may also be down. That means you'll have no way of going out to buy food during your emergency situation. Be sure you have enough food stored to feed yourself until things get back to normal. · Your food storage should be made up of mostly non-perishable foods. These types of products have longer shelf lives than fresh or frozen foods. That way, when you it’s time to eat your emergency food, they're still good for consumption. For good ideas for your 72 hour food storage plan, look into buying canned food, dehydrated food and/or freeze-dried food. Electrical services will probably be non-operational. So, be sure that your flashlight is battery-operated and pack extra batteries. · There will probably be no power in your local area after the disaster strikes. Make sure your radio is battery-powered and be sure you have extra batteries for your radio. I recently had a chance to attend The Ready, Set, Prep Summit in Irving, Texas on March 20-21, 2013 which was hosted by Food Insurance™. I had a chance to network with a number of people in the preparedness community from around the country. I also had the chance to network with and meet a number of people whom I knew only by their online presence. It was a very informative preparedness summit. There were a number of very informative speakers with several new ideas for being prepared that I will cover in later posts on TPN or on my main site at Stealth Survival. You may want to check out the sites of the others in attendance. They all have valuable information that will help you be better prepared. The Summit ended with an appearance by the attendees on the Glen Beck Show as part of his live studio audience. I also like to give a big Texas thanks to our host Food Insurance™.